A relatively new breed on the cat scene, the American Curl has won the hearts of cat fanciers with its quirky ears, sweet temperament, and kittenish personality. Two homeless cats with strange, backward-curling ears showed up on the doorstep of California couple Joe and Grace Ruga to mooch a meal in 1981. One disappeared shortly thereafter, but the other, a longhaired black female, moved in with the Rugas. Subsequently named Shulamith, this stray went on to have 6 kittens, some of which had curled ears, and a new breed was born. The American Curl’s most distinctive features are its luxurious plumed tail, large walnut-shaped eyes, and backward-curling ears that give the cat a happily surprised expression. 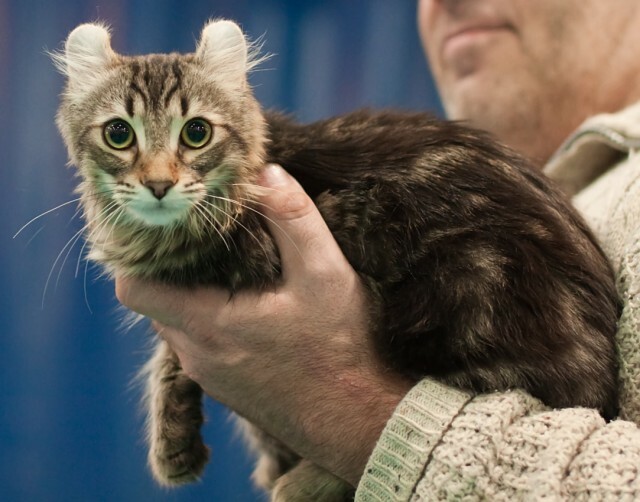 The ear-curling gene, which arose due to a spontaneous mutation, is dominant, meaning that any kitten with one curl-eared parent might inherit the trait. American Curl kittens are born with straight ears. The ears begin firming up and curling backward when they are 3-7 days old. Ears unfurl gradually over the course of 16-18 weeks, after which they are permanently set in the adult position. American Curl ears have an arc that ranges from 90-180 degrees for show quality – those with straighter ears are pet quality only. 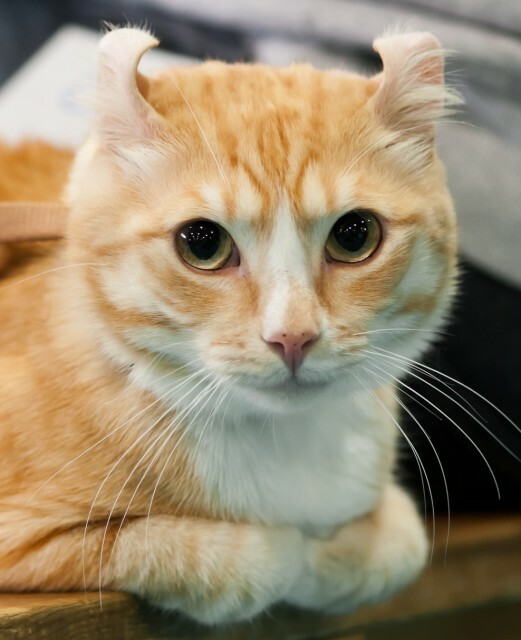 Cats may be disqualified from shows if their ear tips touch their heads or the backs of their ears, or their ears are mismatched. The American Curl’s body is medium-sized and rectangular, and the silky coat lies flat against the skin. Because it has a minimal undercoat, the American Curl does not shed much or require much grooming. The American Curl is a slow-maturing breed, taking 2-3 years to reach full size (though it is capable of procreating much earlier). In adulthood, males usually weigh about 7-10 pounds and females 5-8. 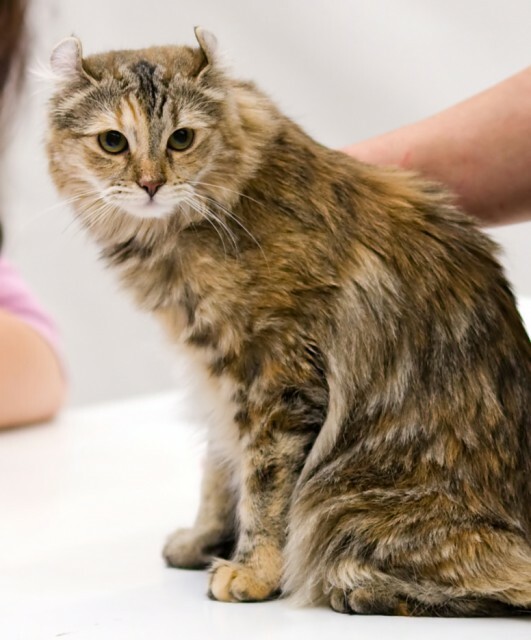 American Curls can be found with both long and short fur, and in a wide variety of colours and patterns, including solid, tortoiseshell, calico, tabby, shaded, smoke, bicolour, and Siamese-style point markings. Known as the Peter Pan of cats, the American Curl retains kitten-like traits into adulthood, including playfulness, friendliness, and inquisitiveness. The highly active nature of the American Curl distinguishes it from the mellow, placid Scottish Fold, another breed with unusual ears. American Curls are usually very accepting of new people and other pets. Because most are good with children, seniors, other cats, and cat-friendly dogs, they can integrate well within a variety of households. The American Curl tends to be sociable, devoted, affectionate, and interactive, though not clingy. Most Curls have sweet dispositions and are rarely aloof. They enjoy cuddling and many are lap cats. American Curls are known for showing affection by gently bumping their heads against people. American Curls need a lot of attention, so they are not a good choice for those who spend much of their time away from home. Quickly becoming bored and lonely without interaction, American Curls do better in households where there are people home much of the time and other pets as well. If obtaining an American Curl kitten, getting at least two is recommended so that they can keep each other company. American Curls are not the most talkative cats, and when they speak, they often make trilling or cooing sounds rather than meowing. When they do meow, their voices tend to be soft and sweet. The American Curl is a healthy, hardy breed overall, free of genetic defects due to a lack of inbreeding. American Curls are bred with non-pedigreed domestic cats, though by 2015, this will no longer be permitted. The original deadline had been set for January 1, 2010, but breeders wanted an extension to promote genetic diversity within the breed. This has made the American Curl less consistent in appearance but healthier overall. The only health issue specifically associated with American Curls is that their ears usually require regular cleaning. Owners can get advice on how to do this from American Curl breeders. Prices for American Curl kittens are quite variable. Purebred American Curls cost approximately $1,000-$2,000 or more when obtained from legitimate breeders, with pet quality kittens at the lower end of the price spectrum and show quality at the upper end. Some pet quality American Curls actually have completely straight ears, but still have the appealing Curl personality, body style, and coat type. To adopt an adult American Curl, visit Petfinder’s American Curl page and the American Curl Cat Rescue page for lists of available American Curls. Helgren, J.A. (2006). “American Curl.” Iams.com. Helgren, J.A. (2010). “Choosing an American Curl.” PetPlace.com. O’Brien, K. (n.d.). “Breed Article: The American Curl: A Balancing Act.” CFAinc.org. Scott, C., Cat Fanciers’ Association. (14 September, 2009). “Breed Profile: American Curl.” CFA.org.